Tinted Lens* "Powers up ""not very effective"" moves. "This Pokemon inflicts double damage with not-very-effective moves. Emerald It unfailingly catches prey in darkness. 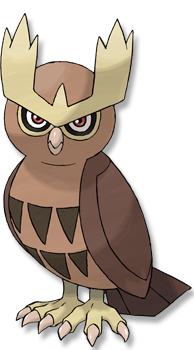 NOCTOWL owe their success to superior vision that allows them to see in minimal light, and to their supple and silent wings. Leaf Green Its eyes are specially adapted. They concentrate even faint light and enable it to see in the dark. Diamond/Pearl If it flips its head upside down, it�s a sign that it is engaged in very complex thinking. Platinum Its eyes are specially developed to enable it to see clearly even in murky darkness and minimal light. Heart Gold Its eyes are specially adapted. They concentrate even faint light and enable it to see in the dark. Soul Silver When it needs to think, it rotates its head 180 degrees to sharpen its intellectual power. Black Its eyes are specially developed to enable it to see clearly even in murky darkness and minimal light. White Its eyes are specially developed to enable it to see clearly even in murky darkness and minimal light.